More than a month after Hurricane Maria devastated Puerto Rico, more than 80% of the U.S. territory is without power. Despite efforts of government agencies and nonprofits must of Puerto Rico is without basic necessities. Puerto Rico is home to about 3.4 million people, beautiful beaches and a massive healthcare industry that employs nearly 90,000 people and supplies not only the island nation with nearly all of its medical supplies but also about 8% of all medicines used in the United States. More than 80 pharmaceutical facilities owned by companies like Amgen Inc. AMGN, Baxter International Inc. (BAX - Get Report) , Mylan NV (MYL - Get Report) , Johnson & Johnson Inc. (JNJ - Get Report) , Medtronic plc and Abbott Laboratories (ABT - Get Report) , reside on the island. There are also more than 50 medical device factories which make a range of products from surgical instruments to cardiac pacemakers. But more than a month after Hurricane Irma devastated the island, it's recovery is in slow motion. About 75% of its residents have no electricity, and about half of the residents don't have water to drink. The infrastructure, which was a weak link to begin with, is in most cases missing as show by the FCC's estimate that 65% of cell service is still down. Couple that with island's continued fight with a potential $74 billion bankruptcy filing, and that infrastructure does not seem to be getting better anytime soom. Many have serious fears about Puerto Rico's healthcare industry both from an in-bound and out-bound perspective. FDA Commissioner Scott Gottlieb told a congressional hearing Oct. 24 that if power isn't returned to the electrical grid in Puerto Rico by the end of the year, he worries about both drug and medical device shortages. Gottlieb was speaking before the House Energy and Commerce Committee. TheStreet reached out to various organizations, companies and government agencies to provide an update on the state of Puerto Rico's healthcare industry, its power grid and what companies are doing to adapt and provide the island with the supplies it needs. The FDA commissioner said his agency has put a watch list together of 30 drugs and 50 medical devices it has had concerns about since the island was swapped by the hurricanes. The FDA has worked with both pharmaceutical and medical device companies since the storms, focusing on blood-related devices. No drug shortages related to the storms have been announced. About 8% of the medicines used by Americans come from the island, Gottlieb said. Among the types of products made in Puerto Rico are blood fraction products, cardiovascular drugs and therapies for cancer and HIV. About 80% of the drug products made in Puerto Rico are consumed by the island population and patients in the U.S.
A good example of how the crisis is moving beyond the island is a recent move by the FDA to allow Baxter to import mini-bags from Australia, Canada, Mexico and Ireland because the facility in Puerto Rico is still in recovery mode. Mini-bags are used to dilute drugs like antibiotics for intravenous use. Mylan's Kashtan said the company was proactive regarding its employees, arranging for temporary housing and chartering a cargo plane with 36,000 pounds of essentials including food, water, generators and even chain saws to clear debris. Mylan is not the only healthcare company that contributed to the island and their employees. The Medtronic Foundation has donated $1 million and matched employee contributions to support the recovery. Baxter delivered 25,000 pounds of supplies to its employees, established the Baxter Employee Disaster Relief Fund and donated $3.5 million through its employees giving and Baxter International Foundation. And Amgen has pledged a total of $5 million in support with $2 million of that being long-term cash. The drug and medical device companies were drawn to the island by a 1976 tax break that allowed U.S. manufacturing companies to avoid corporate income tax on profits made in U.S. territories. And those companies have built an industry on the island while polishing their bottom lines. But it is unclear how they would react if a bankruptcy brought severe austerity to the island. Gottlieb said that many plants are running at 20% capacity. While the island has been leveled in some places and much of the activity has been on getting through the crisis, the impact of shuttered pharma and medical device facilities on the island is significant. The health industry employs almost 90,0000 of the 3.4 million residents and makes up more than 30% of Puerto Rico's GNP. In an email to The Street, Baxter said it remains in limited production in its three island facilities and while the FDA has allowed importation of products to the U.S., the regulatory relief "will not be adequate to fully bridge the gap in the fourth quarter." 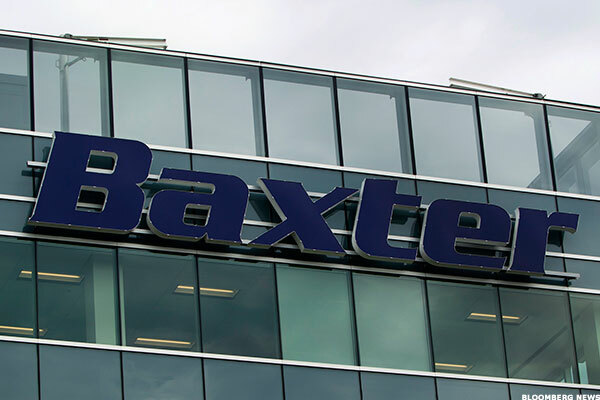 Baxter is ramping up production at some European plants to offset lost production in Puerto Rico. It is projecting a negative impact of $70 million in fourth quarter revenues tied to Hurricane Maria. The company has 2,000 Puerto Rican employees. Fernando Vivanco, senior director of corporate communications at Medtronic said his company has made progress in its island operations. The company has almost 5,000 employees and contractors in Puerto Rico and the hurricanes have impacted operations across the company's four sectors, cardiac and vascular, diabetes, minimally invasive therapies and restorative therapies. The company says it expects some products from its minimally invasive and restorative therapies groups to be impacted in terms of supplying U.S. patients. Medtronic expects an impact of both revenue and non-GAAP net earnings up to $250 million in the fiscal second quarter 2018, which closes Oct. 27. Amgen expects to resume formulation/filling small molecule commercial products by the end of October. Shipping has resumed out of its Puerto Rico warehouse. The company has increased some production in Europe to absorb lost volume on the island. Mylan, which has one manufacturing plant in Caguas that employs 400, is operating at the same level as it did before the hurricane, according to Lauren Kashtan, head of North America communications. While companies and government agencies on the island will continue to do their part to bring facilities back on line and get supplies to people in need, the key to reviving the island relies largely on its ability to get to power grid back to 100%. Gottlieb stressed the need to restore power to the island's troubled power grid in his testimony before congress. Thanks in part to Puerto Rico's well publicized debt woes, its infrastructure was known to be a weak link before the hurricanes brought their torrential rains and 100 mile an hour winds. And it's an open question just how quickly power might be restored following the hiring of Whitefish Energy, a two-person company to a $300 million contract by Puerto Rico Electric Power Authority, which went bankrupt in July with $8 billion in debt. PREPA is staring at a situation where 75% of the territory's residents are still without power, more than a month after the storm made landfall Sept. 20, according to U.S. Department of Energy data. Two-year old Whitefish is adding contract employees and has more than 300 on the ground with plans to add another 700. But its no-bid hiring has caused controversy. The company, named after the city it calls home in Montana, is under a microscope because of connections to the Trump administration. Its CEO Andy Techmanski has a relationship with Interior Secretary Ryan Zinke, and one of Zinke's sons has worked for Whitefish in a summer job, according to the Washington Post. Zinke went on the offensive Oct. 27, tweeting that "Only in elitist Washington D.C. would being from a small town be a crime." He added that he had nothing to do with the contract. The dust-up over the Whitefish hiring has another political angle. Whitefish is backed financially by private equity firms HBC Investments and Flat Creek Capital out of Dallas as well as Brazil-based Comtrafo Transformers. HBC's general partner Joe Colonnetta made a total of $5,400 in political contributions to Trump's primary and general campaigns as well as $20,000 to the Trump victory PAC and $30,700 to the Republican National Committee in 2016, according to data from the Federal Elections Commission. The campaign donations were first reported by the Daily Beast. Whitefish, literally a father and son operation, has taken exception with those questioning the company's size and political connections, saying that Whitefish has moved quickly while the U.S. government's response was slower. "We were one of two companies that came down," said Ken Luce, a Whitefish spokesman. "One of those companies wanted a $25 million deposit to start the work, one wanted $2 million, and that was us." Besides a cheaper deposit, Luce said his client won the job because Whitefish has experience working in mountains, which was one of the requirements. And while Puerto Rico, and PREPA in particular has a debt issue, Whitefish feels the the risk has been mitigated. "We have a lower overhead so we have a lower calculated risk." The Department of Homeland Security's inspector general said it plans an audit of the Whitefish contract. The White House appeared to be distancing itself from the controversy, saying Oct. 27 that the Whitefish contract with PREPA was done without any participation of federal officials. The Federal Emergency Management Agency said it had "significant concerns about the contract and may not help cover costs if the Whitefish deal is found wanting. 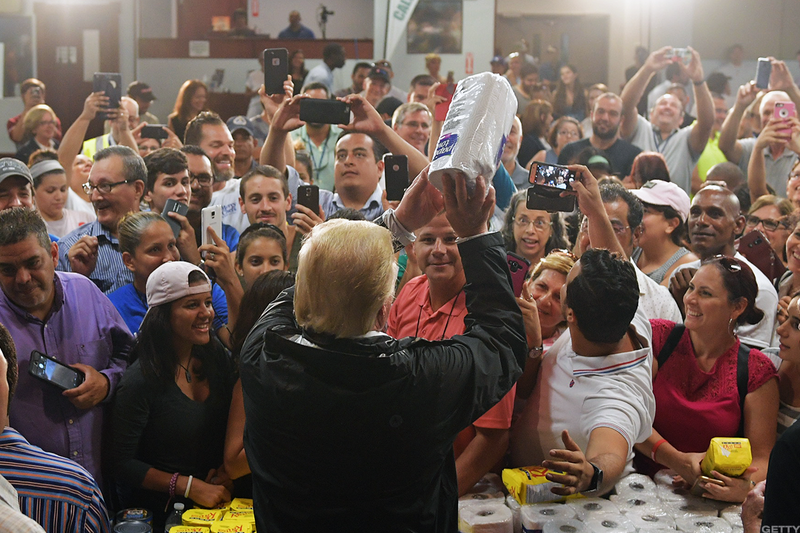 The efforts by the Trump administration to get aid to Puerto Rico's millions of residents have come under sharp criticism as an inadequate response. Trump visited Puerto Rico on Oct. 4. The condemnation grew louder after the President tweeted about the island's troubled finances, pointing at its debt, "billions of dollars (owed) to Wall Street and the banks which, sadly, must be dealt with." He followed that tweet later with "we cannot keep FEMA, the Military & First Responders, who have been amazing (under the most difficult circumstances) in P.R. forever!"